Germanys‘ population in age groups 2016: i.e. 15.65 % of currently 81.58 million people are aged between 25 and 39 years; Roughly a quarter is aged 40 to 59…. Since 1972 more people die compared to new born. Germany’s population is shrinking, from currently 81.58 million down to 76.12 million in 2050 or even 73.08 million in 2060! So 2 facts are important to understand Germanys’ challenge: shrinking and ageing at the same time in near future! 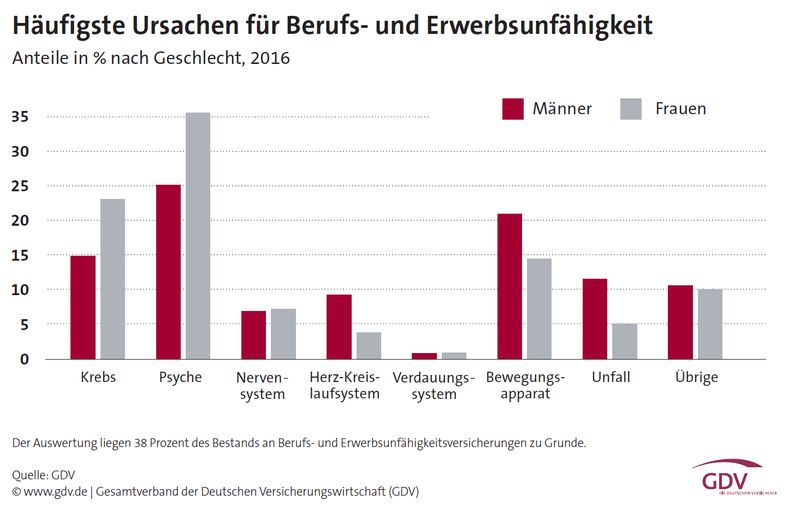 2015: Women on average: € 640 in Western Germany (€ 717 East), Men on average € 702 (€ 643 East). Additional Disability cover – as EB or privately covered – is core! Illness: the medical doctor “approves” that you can’t work. Employer will still have to pay your salary for the following 6 weeks! Your old-age – pension will become very low as you will miss to pay into the system…. 1 out of 5 employees are becoming disabled during their working life. Health insurance will cover the cost in hospital. In case of an accident the accident and dismemberment insurance will cover the dismemberment due to the accident. However in case of a disability due to illness none of the above mentioned will cover the replacement of your income. Due to statistics it is happening 9-times more often to become disabled due to illness than due to an accident. Cancer and psychological injuries are the most often reasons to become disabled! In so far professionals with academic education seem to be less affected by disability than a craftsperson. However mental stress can easily lead to psychological indisposition.